They even get tucked in every night. 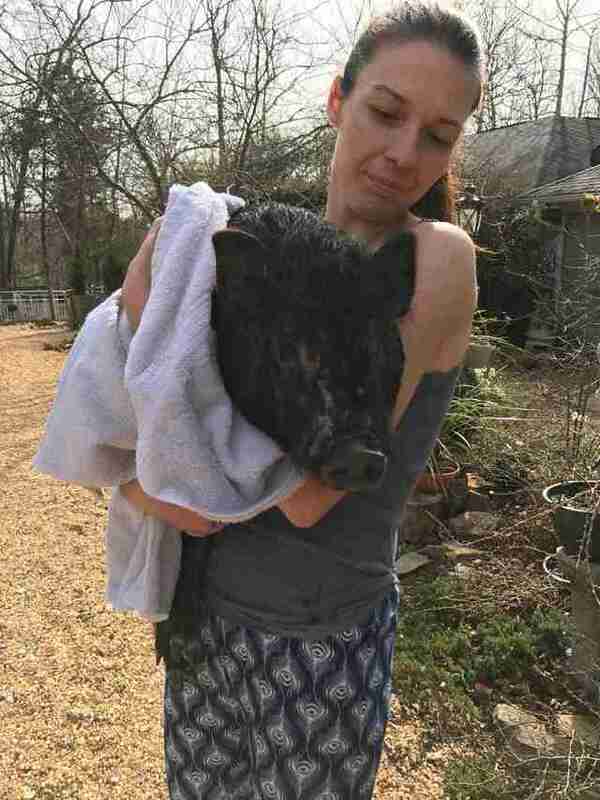 Two months ago, Alesja Daehnrich saw three potbellied pigs up for auction at a county animal shelter in North Carolina, and she knew she had to do something. 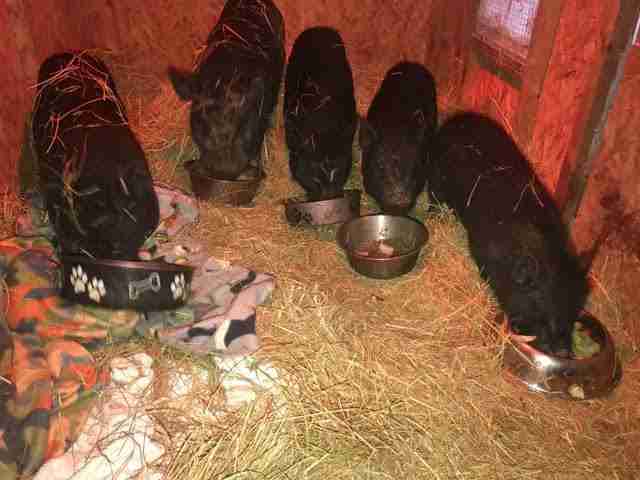 The 6-month-old pigs looked skinny and scared, and Daehnrich worried that the wrong kind of people would buy them. The auction started at just $30 for each of them. 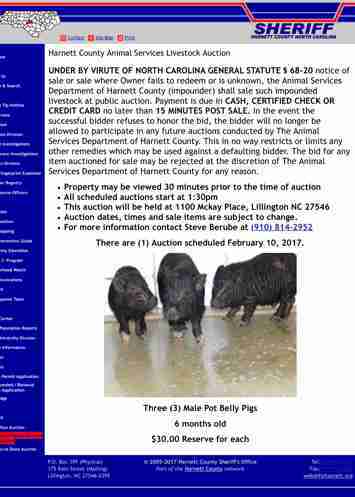 "Auctions can be scary as you never know who will show up, and whether someone inexperienced will want to get a pig, or if someone will want to raise a piglet for meat," Daehnrich, cofounder of Blind Spot Animal Sanctuary, told The Dodo. 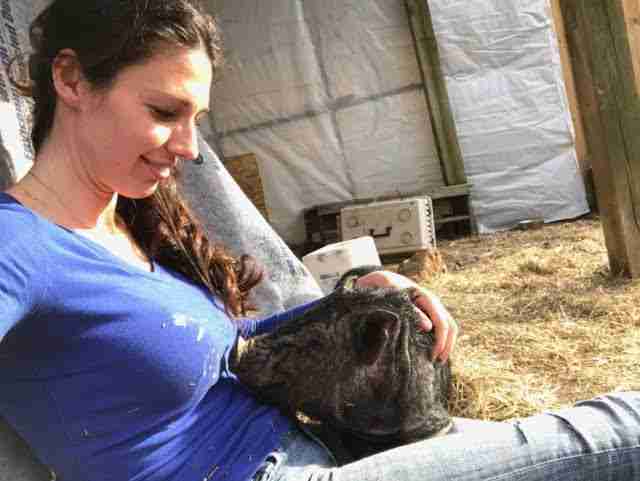 Daehnrich and her husband Alex went to the shelter to meet the pigs, and they were shocked to see how unhealthy they were. "All three were so malnourished, had severe mange, and were extremely itchy and covered in wounds from scratching," Alejsa Daehnrich said. 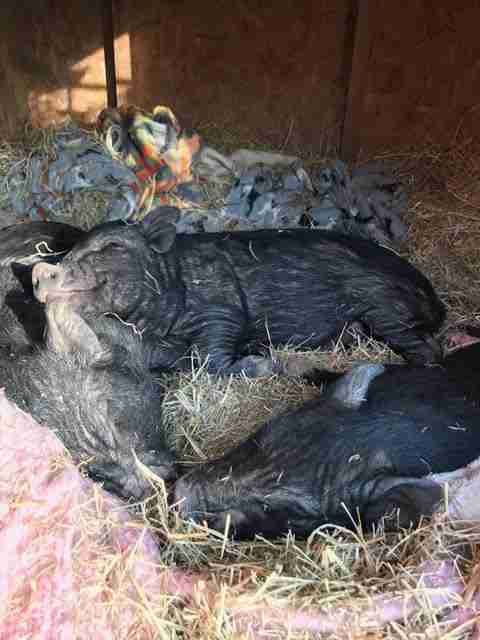 The pigs had come from a private residence where they'd been severely neglected, according to Daehnrich. They also had bite marks on their ears, which suggested they'd been attacked by dogs. Unfortunately, the shelter staff couldn't release the pigs until they'd been held for 10 days after their rescue, Daehnrich explained. 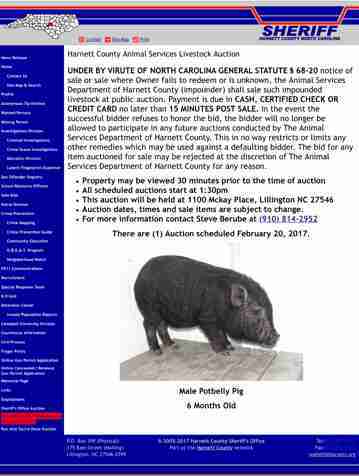 Then the shelter was legally bound to put the pigs up for auction. So Daehnrich and her husband suffered an agonizing wait. On the day of the auction, they raced back to the shelter, ready to bid against anyone who wanted the pigs. 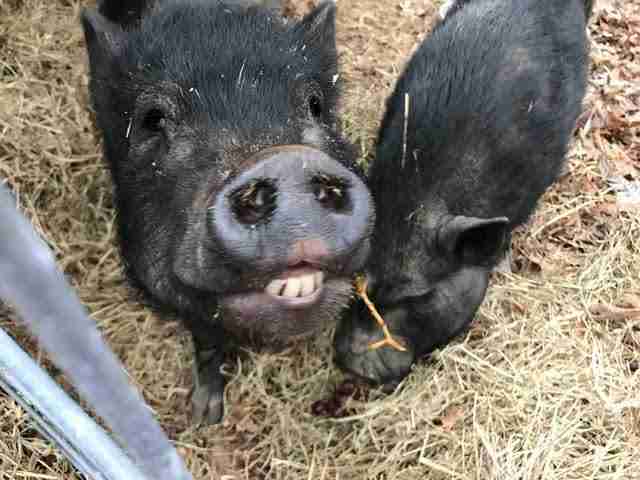 Thankfully, no one bid on the pigs, and the Daehnrichs were able to take them home to their sanctuary that day. 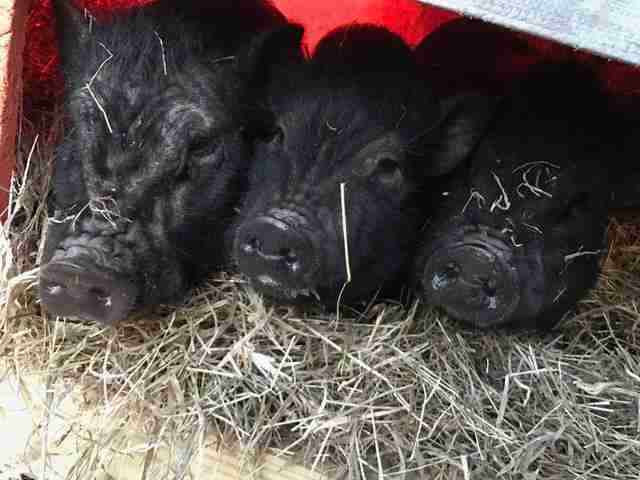 They named the pigs after the Three Stooges - Larry, Curly and Moe. 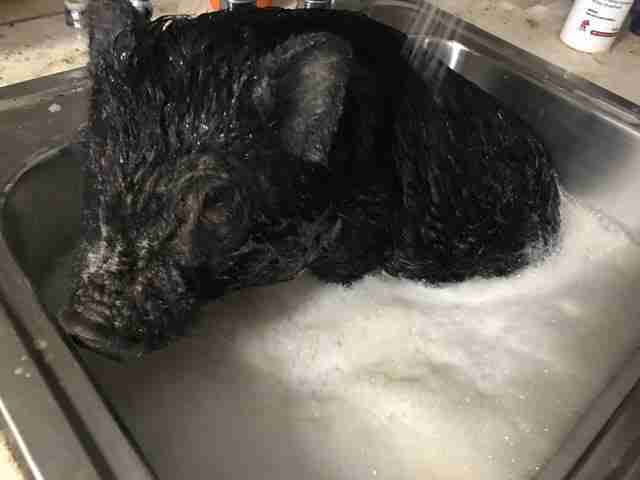 The first thing the Daehnrichs did was arrange a visit from the vet, who gave the pigs antibiotics, deworming medicine and medicated baths for their mange. Then Larry, Curly and Moe got on with the job of settling into their new home. At first, they were terrified of Daehnrich and her husband, and they ran each time they saw them, but they slowly began to trust them. Soon they were crawling into the Daehnrichs' laps for belly rubs. "It was incredibly sweet to see this transformation," Alesja Daehnrich said. A few weeks later, everyone got the biggest surprise. 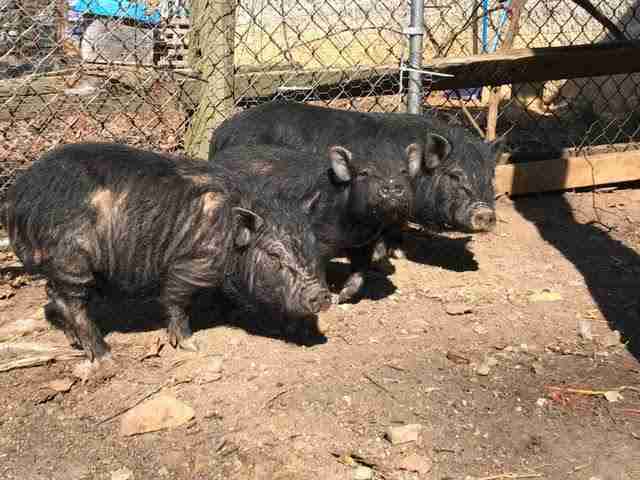 The shelter reached out to the Daehnrichs to tell them that they'd gotten a fourth pig, and he was a sibling of Larry, Curly and Moe. 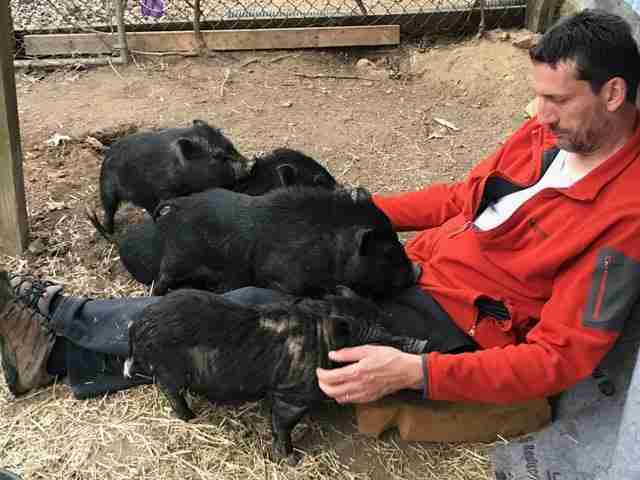 The Daehnrichs were already overstretched, caring for over 40 rescued animals at the sanctuary - including several other potbellied pigs - but they couldn't turn their backs on this fourth pig, whom they named Sam. "We did not want to leave family behind," Alesja Daehnrich said. 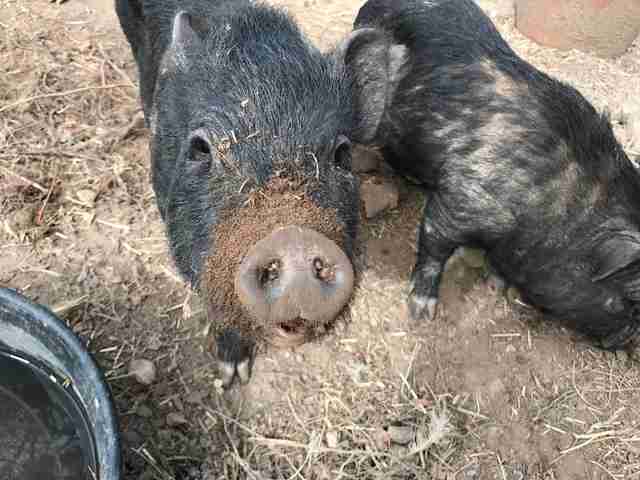 As with the other pigs, the shelter couldn't release Sam immediately - he had to be held for 10-days, and put up for auction. But Daehnrich found a way to break this procedure. "The fourth sibling was in such a poor shape that he wouldn't have survived the 10-day hold at the shelter," Alesja Daehnrich said. 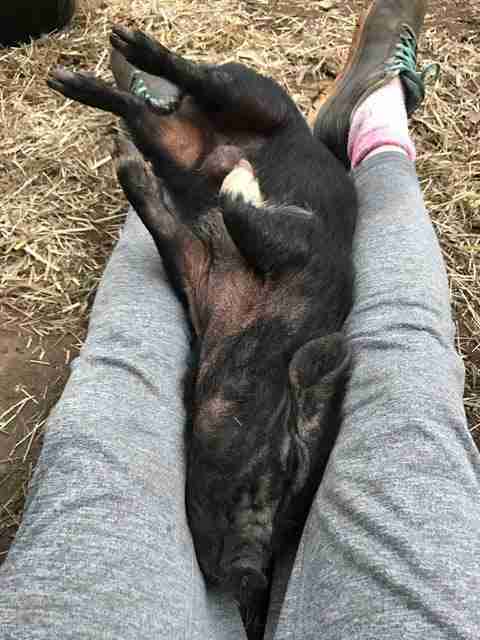 "But the shelter director made it possible for us to take him in as a foster so that he could receive vet care, but we had to promise to come back for the auction so that the shelter wouldn't break any laws." On the day of the auction, Daehnrich drove back to the shelter with Sam in the car, prepared to bid against anyone who wanted him. "Sam must have remembered the shelter noises and was quite stressed," Alesja Daehnrich said. "Luckily, the shelter allowed Sam to stay in the car with one of us equipped with water and snacks. 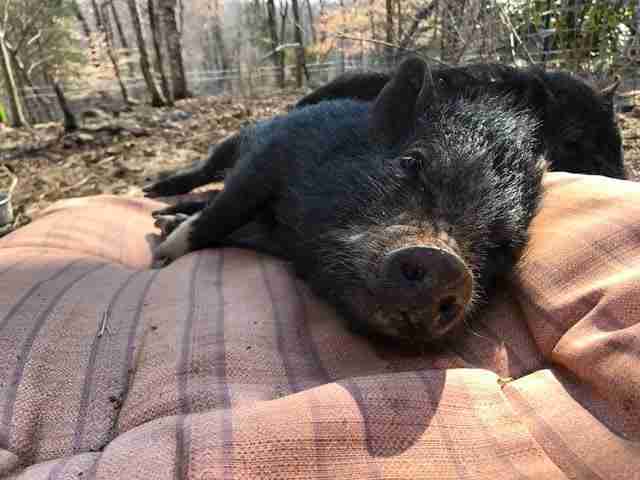 After nobody showed up to the auction again, and we were able to make this final, and welcome Sam as a sanctuary resident." Larry, Curly and Moe immediately recognized their brother. "It was incredibly sweet to see all four reunited," Alesja Daehnrich said. "The Three Stooges took Sam in without any issues and they started to thrive all together." Now the four siblings spend their days playing, rooting around the soil and snuggling. They also love watching the goats and chickens through the fence and greeting visitors, according to Alesja Daehnrich. "They started to become the most loving little souls," Alesja Daehnrich said. "They love to be tucked in every night, and like any kids, they escape their bed in the evening - and my husband has to go back, put them all back into bed and tuck them in again." "It is our promise to the little guys that they will never come near a shelter or an auction ever again," Alesja Daehnrich added. 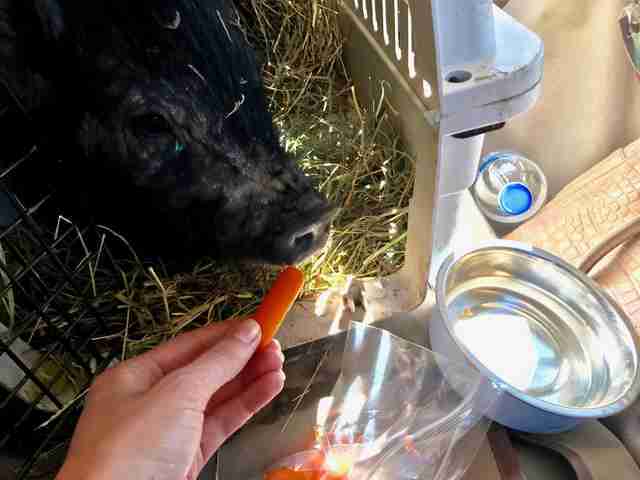 After Sam's arrival, the Daehnrichs got yet another surprise - the pigs' parents turned up at the shelter, too. Despite their sanctuary being close to capacity, the Daehnrichs couldn't turn their back on the parents. They took them in, naming them Wilson and Betty. 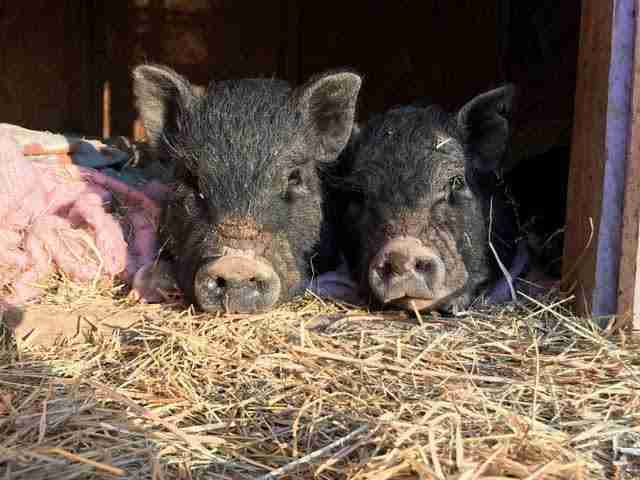 Now, they hope to find forever homes for all of the pigs. 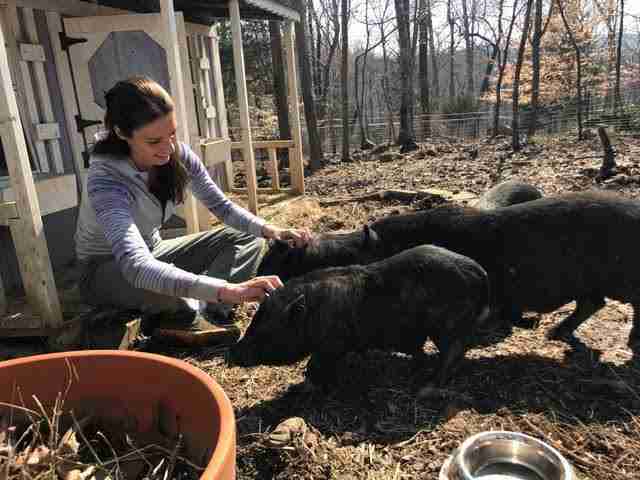 "We would love the piglets to be adopted in pairs if there are no other pigs in the home, as pigs are herd animals and shouldn't live a lonely life," Alesja Daehnrich said. "We hope for a family that would spend time with them, as they love attention. 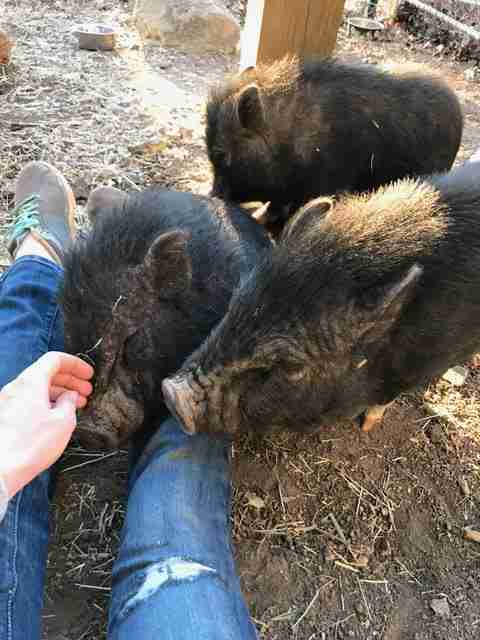 These pigs went from being petrified of people and running for their life to absolute sweethearts who enjoy human touch and are discovering a whole new world." If you're interested in adopting Larry, Curly, Moe, Sam, Wilson or Betty, contact the sanctuary. You can also help Blind Spot Animal Sanctuary save more lives by making a donation.